Over on Facebook's needlepoint group known as Needlepoint Nation, one of the most common questions I hear is How Do I learn Needlepoint?, immediately followed by How Do I Go From All Tent Stitched Canvases to Fancier Ones? This article is intended to pull together information available via the Internet for those who don't have a local shop to help them. If you do have a needlepoint shop in your area, they will be your best friend when it comes to learning and then improving your stitching. If you are in a larger city, check the Yellow Pages to see if there is a shop with needlepoint supplies in the area. The National NeedleArts Association (TNNA) is an organization for shops and designers and other needle arts businesses. A good way to find a local shop is to search their directory. Not every shop that sells needlepoint belongs to TNNA but any shop that does is serious about needlepoint. Use the pull-down menus to sort through types of shops, states, etc. Vetty Creations in Australia has created a series of small beginner pieces. These kits come with everything you need and are worked from charts. In Stitches in Atlanta has a great little book called "How to Needlepoint" that will teach you the basics. The National NeedleArts Association (TNNA) has a great little booklet to teach you the basics of needlepoint. This is how I learned eons ago. Many needlepoint shops and Amazon carry the booklet. The Needlepointer has some darling beginner kits called 1st Stitch that have everything you need to start stitching and even include a frame for finishing your piece at the end. Needlepoint for Fun has a large range of beginner kits, including some Stitch and Zip pieces that are self-finishing. 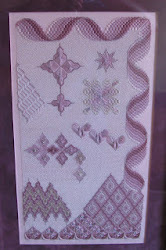 Twisted Stitches Needlepoint in Albuquerque, New Mexico has several beginner classes that are said to be very good. They are on site, though. Not online. Several shops have learning areas for new stitchers and are making a special effort to kit up new pieces suitable for beginners. Wellesley Needlepoint has started posting videos for beginners on their website in the Learning section. Currently there is a two part introduction to needlepoint and a video about basketweave. 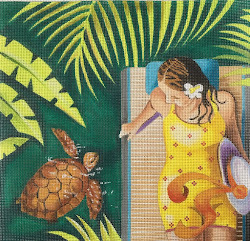 Kimberly Ann Needlepoint has #SheStitches, a new collection of kits to teach needlepoint. Each kit includes a detailed stitch guide, canvas, threads and needle. They are available for two different level of stitchers. Level 1- to learn the very basics of Needlepoint and Level 2- an introduction to decorative stitches. Kimberly Ann also has the #SheStitches Kit Collection which is larger count painted canvases, geared toward tempting young women to learn needlepoint. Comfy Cottage and Beth Gantz have collaborated on an cyber class to teach new stitchers. They sell a $45 kit to go with the class (second link below). The third link below is the first YouTube video for the class. Once you watch video one, click on the others listed on the right side of the page or go to the fourth link below, which is to their YouTube channel which is full of useful tips on how to put canvas on stretcher bars and how to do a variety of fairly common stitches. Here's Comfy Cottage's newest kits that include free video help. The Needlepoint Teacher website has loads of information for beginners. This section talks about stretcher bars but check the left side of the page for more help and tips. Enriched Stitch in Connecticut has written a list of tips for new stitchers. Needlepoint.com is in North Carolina. Below their kits and stitching supplies is a collection of videos to help visual learners. There's everything from how to put stretcher bars together to how to use a needle threader and ply threads. 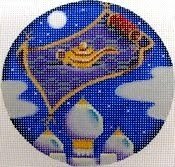 Needlepoint.com also has a lot of online classes. You get a kit in the mail and access to their online videos explaining the focus of the class. Needlepoint For Fun has a great many tips on their Basic Needlepoint Stitches page and at the bottom you can click to see even more stitches. The header at the top of the page has a "How To" section that will talk about many important things including how to rip out if you make a mistake, how to clean needlepoint, how to estimate how much thread you'll need, etc. Under "Kits" there is a section called Beginner Kits which has pieces suitable for beginners. I recommend you sign up for their newsletter which is terrific. NP For Fun also has a blog that's not very active but which also has some great articles. Threadneedle Street in Washington State has a wonderful page of hints and tips. Ridgewood Needlepoint in Ridgewood, NJ carries beginner kits for kids. These have everything you need to work a project on 7 count canvas. DMC has kits for kids if you have a young person who wants to learn. You can order these online. Abigail Cecile explains needlepoint to beginners. There are a great many online courses to help you learn various aspects of needlepoint once you are past the beginner stage. Sign up for the Shining Needle Society in Yahoo Groups to get notices of their classes, check the American Needlepoint Guild website for their latest (you have to be a member to take cyberclasses), and watch for new cyberclasses from Sandy Arthur or Laura Perin. If you have blank needlepoint canvas and thread (you can substitute 10 count plastic canvas and knitting yarn or DMC's cotton floss or cotton perle from the big crafts emporiums although this will throw the size of a project off because most needlepoint projects are on 18 count needlepoint canvas), you can do all sorts of wonderful geometric pieces to have fun while you learn. The American Needlepoint Guild and the thread companies Rainbow Gallery and Caron all have great projects online. Let's start with ANG's website. This is the direct link to their Stitch of the Month program. Most months a new stitch is shown that is used in a project. At first the projects were only unveiled in December but for the last few years the project is a mystery one that starts in January. You will be told what supplies you need and each month you will work another section using a new stitch. The thread companys' projects are done to promote their products but don't let that stop you. Use any thread you can get your hands on to work some of these delightful designs. Here is the Caron website. Projects are hidden in several places here. Look under "Online Classes," "Free Patterns," "Designer Spotlights" and "Kids Projects" until you find something that appeals to you. Here is the Rainbow Gallery website's free needlepoint charts. Both websites have many tips on how to use their threads and online color cards to help you choose threads or use those you are unfamiliar with. The designer SharonG has an interesting article that outlines her philosophy for embellishing painted canvases. Needlepoint for Fun has an article called "Basic Theory For How to Choose Needlepoint Stitches" on their website. Ruth Dilts's Needlepoint 101 and Needlepoint 202 books are also useful. They are not as helpful for looking things up but I think they are very inspirational for new stitchers as Ruth shows off a series of projects and explains what stitch (with diagrams!) she used and why. You can use Ruth's ideas for beards, clothes, houses, etc. over and over in your own projects. Her books are not as full of stitches as the Stitches for Effect series but they are cheaper if you aren't certain you want to learn embellishment. Come to the Point in San Rafael, CA stocks beginner kits for $19.95 from DeElda (second link below). For the older beginner, they suggest the Lee three inch round ornaments and they stock a nice assortment of those. Call the shop and ask Michelle for help if you need to mail order supplies. Ridgewood also has a nice beginner class kit. They teach this in the shop but are willing to send it via mail order to folks who aren't in New Jersey. As you can see, this is customized with the right initial for you. Needlepoint.com in Raleigh, NC has beginner kits and beginner videos online, and they do several cyberclasses with videos to help their long distance students whether they are just starting or want to learn new techniques. BeStitched in Arizona has what they call the Stitch Addiction Boxes Club. These are a monthly delivery of interesting threads and gadgets with videos on how to use them. This is perfect for the stitcher who wants to branch out, even if they are a tad pricey. These are the most basic resources available. There are many, many more. For example, at the bottom of the front page of Blog I list all the sites I know about with online stitch diagrams and online thread and color assistance. There is also a tab at the top of this page called "Tutorials and Hints" which might answer your question. If you know of a shop or website that has special online help for new stitchers that I don't have listed, let me know by using the Comment section below or emailing me at chillyhollow at hotmaildotcom. Thanks!